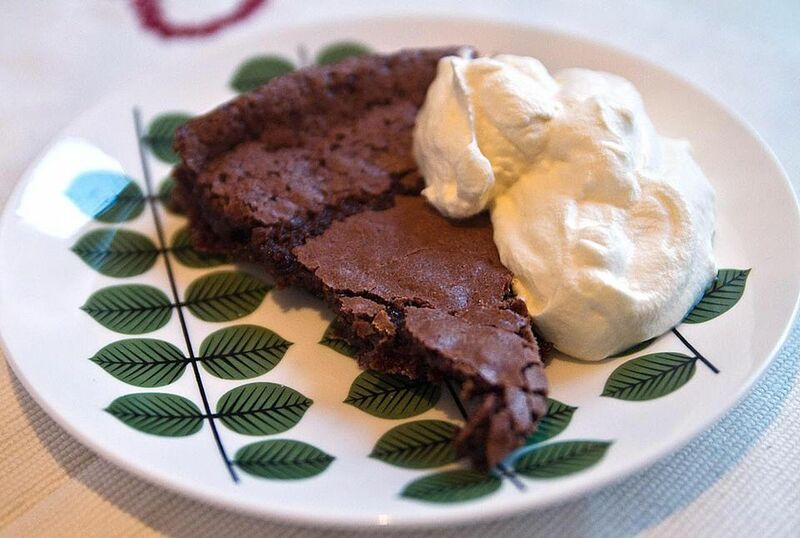 Kladdkaka, or chocolate sticky cake, is Sweden’s gift to all chocoholics. It is rich, fulfilling and ready to eat within the hour. After all, chocolate—like cooking—should never be complicated. The best part is that this chocolate cake is multi-dimensional. It has a crispy outer edge and gooey center, much like under-baked brownies. This recipe is so simple that it can easily become your new go-to cake recipe. It requires just a few common baking ingredients and if you keep them in your kitchen, you can bake this cake anytime a chocolate craving hits. Preheat oven to 350 F. Lightly butter an 8- or 9-inch round springform or cake pan. In a large bowl, whisk together the eggs and sugar. Gradually mix in the flour and salt. In a separate bowl, stir cocoa and vanilla sugar (or extract) into melted butter until well-combined. Add cocoa-butter mixture to the batter, stirring well until any lumps are removed. Bake for 25 minutes. Check for doneness: the edges of the cake should be crisp but the center still moist and sticky. A good test is to insert a toothpick first into the cake’s edge: it should come out clean. Then, insert it into the center of the cake: it should come out smeared with gooey, melting chocolate. Do not overcook the cake (but if you do, you’ll have stellar brownies as a compensation prize). Dust with powdered sugar and serve with whipped cream, if desired.